Cystic Fibrosis. Do those words have meaning to you? Is it something you’ve heard of but know little about? Maybe you’re all too familiar with those two short words? Or perhaps you’re like most people and have no idea what they mean and the impact they have on one’s life. Obviously the term, Cystic Fibrosis, carries much meaning for Jody and I. Actually, I have a love/hate relationship with CF. I have met so many great people because of this disease and our shared understanding of it. It’s been neat to see how this blog has connected some of us, something I never would have imagined when I started it. This disease has allowed me to be a part of a group of fellow CF Wives online and they are a great resource and support when I need it. I’m also thankful for all the healthcare workers (especially ours) who have made treating people with CF their life’s work. There are many things I don’t like about this disease, clearly it’s taken us down some difficult paths we would not have chosen for ourselves. My heart breaks for those I know, or have learned of, who have had lives cut short because of Cystic Fibrosis, and I thank you for sharing those stories with me. What it boils down to is… WE NEED A CURE! Jody and I have been asked to participate in the Lancaster area Cystic Fibrosis Foundation – Great Strides Walk for CF. Actually, Jody has been chosen as the Honorary Chairman of the walk and we will be saying a few brief words at the event. In addition, our team will be leading the walk. Will you join us? Great Strides is the foundations largest fundraising event with more than 125,000 people participating, nationwide. Funds raised support Cystic Fibrosis research and drug development, moving us closer to the cure we so desperately need. We believe in the work of this foundation because we have been touched by it directly. We would love to have you join us, team Journey with Jody, for some fun and exercise while supporting a cause that is near and dear to our hearts. And since Jody is the star of our team, and the honorary chairman of the walk, you’ll be supporting him too. Click this link to join our team or to make a tax-deductible donation to team Journey with Jody. I’m ready to walk for a cure… are you? 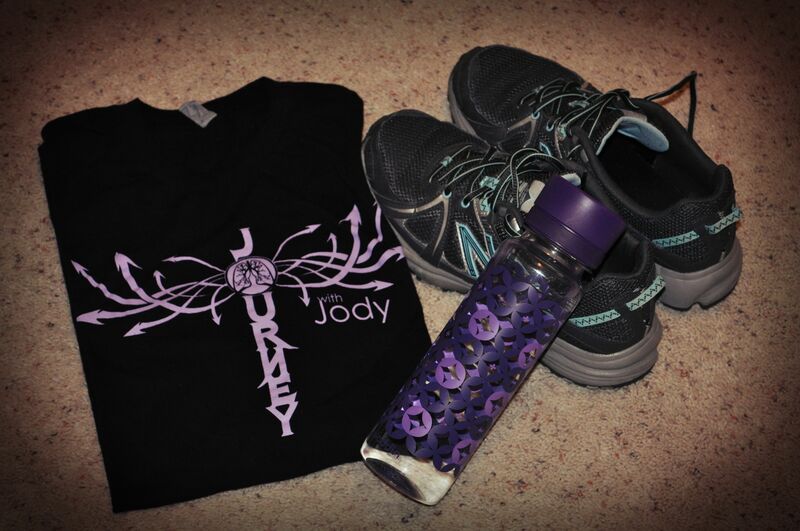 FYI we will be using the Journey with Jody shirts we sold at our auction as our team shirts. We have a few left if you are interested in purchasing one. If you do not have one just wear a black shirt (and only if you’re feeling really crafty, decorate it with your own Journey with Jody lettering). This is a family friendly event that includes activities for kids. We Hollands, are excited to walk with you! Looking forward to it and to hear Jody talk. I’ll be there !! Can’t wait to hear Jody speak .